Located on the beachfront at beautiful Byron Bay, First Sun Holiday Park offers you everything Byron Bay is world renowned for, literally metres from your cabin, hut, caravan or tent. 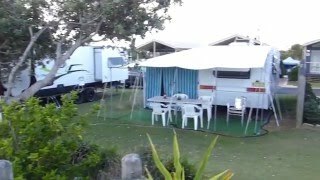 Facilities are first class and the views towards The Wreck, Byron Lighthouse, Mount Warning and beyond, are only a few reasons why you should visit First Sun Holiday Park. Accommodation includes self-contained cabins, lodges, hippy huts, powered and unpowered caravan sites, and a shady camp area. At First Sun Holiday Park you need never take your car anywhere, because everything is so close at hand.